I spent the weekend in Kentucky’s Red River Gorge and it was interesting to hear how quickly news spreads down there. Multiple times throughout the weekend I heard whispers of some blogger climbing 5.12 a young girl climbing a 5.14a and some kid from France repeating a 5.14d. I get home and sure enough the internet tells me the same thing. 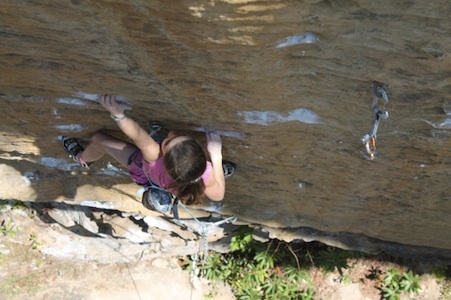 At the Gold Coast it was 10-year-old Brook Raboutou making quick work of God’s Own Stone (5.14a) according to this post on the Team ABC website. If there were world records in climbing this would surely set quite a few as she is the youngest female to climb this grade. On the same day as Raboutou’s send, the French phenom Enzo Oddo was over at the Chocolate Factory where he managed to repeat Jonathan Siegrist’s Pure Imagination (5.14d). Oddo is no stranger to success both at home in Europe as well as here in the U.S. In prior trips to the U.S. he has repeated Just Do It at Smith Rock and climbed several highballs in Bishop. Not in the Red, but also climbing hard at a young age was 10-year-old Tito Traversa. On the same day as Raboutou and Oddo’s send he was at Tetto di Sarre, Italy doing his first 5.14a called Sarsifal L2. Traversa climbed the 5.13d first section of this route last year before returning this year to link the full line together. Indeed, his vision is pretty incredible isn’t it? Has Pure Imagination been sent by anyone who weighs more than 95lbs? The future of climbing is here! Love your work but It’s really strange to me that you report on young children climbing grades that are not notable for elite climbers yet post that the “viral” video of an infant going up a climbing wall is pretty much bunk (implied at least). Maybe it’s all pretty much bunk. Strength to weight ratio goes pretty far to do some hard stuff in this sport, and kids have it over adults. It’s not radically different from gymnastics. While many kids have this advantage, very few have the mental aspects in place to excel. Those who do, and are guided properly by parents/peer climbing mentors, do some great things for their ages. We all must recognize that for these elite children, it likely comes rather “easily” to them. The infant is actually a pretty crazy advanced mental aberration; I would think equally as notable and Enzo Oddo’s feats, etc., if not more due to the rareness of a child this young having the coordination and understanding of how to scale such an innately odd structure. My take is that the “age factor” will become trite and pointless fairly soon (if it isn’t already). Thus, the climbing media that tend to focus upon notable ascents shouldn’t factor in age as a relevant criterion. We all pretty much understand at this point that young kids–boys and girls alike–can climb much “harder” than the average “advanced” adult climber may ever be able to. That said, it really shouldn’t be news, unless it’s a first ascent or a notable repeat (and yes, I understand that Oddo’s repeat of the Jorg Milks boulder qualifies as such). I think you should stop harping and let Narc post what he wants. It’s his site, he links great climbing videos, has thoughtful commentary with a touch of self-deprecation. I also find it cool that these kids are cranking and don’t feel it needs to be a notable ascent by grade in order to make it worthwhile. It’s topical b/c of all the *hard* and ‘hard’ ascents by these youngsters. The post about the infant climbing wasn’t a commentary on kids climbing but rather a commentary on the sorts of climbing stories that catch the attention of the general populace. As for the newsworthiness of kids climbing hard, I agree that this will probably become commonplace in the years to come, but for now it is still a relatively rare thing. Of course I recognize that this is Narc’s site and therefore, he has the complete freedom to post what ever he feels like. A critique of some very small aspect of someone’s work is not a damning indictment of his/her entire opus. As I stated, I love what Narc does here and I fully agree that his writing style is spot on. He’s a much more engaging and readable writer than many of the “big” names currently employed the major climbing media. Love the internet – comment boards are so full of jack-wagons, that we all can become a little over sensitive to thoughtful questioning. I agree that for the next few years we’ll be in a funny transitional time when kids climbing hard is still a little less than normal. In the near future I think we’ll see well-coached kids (IE Robyn’s offspring), on routes with tick marks/good beta repeating the hardest ascents. It’ll be interesting on FAs, though. John to your point about toddlers climbing- it actually is very intuitive for them, even on climbing walls. My 15-month old child enjoys our climbing wall. She’ll touch all the holds, feel the textures and move around and just fool around with them; but as soon as you nag something up the wall (toy, banana) she’ll head right to it – grabbing, pulling, highstepping, etc. I think our simian ancestory is much stronger than we realize. I think it’s one of the reasons we all instinctively enjoy climbing. And I think I need to start hanging chocaltely treats at the top of all my would be red-points. PS- to all the potentially freaked out responders: baby likes to play on the wall, it’s very safe, completely supervised, and we are in no way tennis parents. Yeah, I kinda thought about your point about innateness of climbing after I wrote what I wrote. Everyone knows kids love to climb things; trees, jungle gyms, you name it. I think all of what you say here is correct. I was just thinking about my experience with kids parties when I worked in a gym. Some just completely “get it” and some have no clue; very little bodily-kinesthetic sense if you will. Still, seeing what is essentially a baby “get it” as well or better than the average group of boy scouts (who are in my experience, the least adept beginning climbing groups!) is still really impressive to me. Leave a Reply to Dustin Click here to cancel reply.